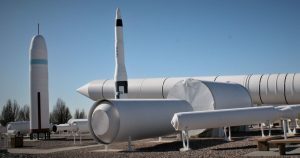 There are 30 different rockets, rocket motors and missiles on display at Northrop Grumman Innovation Systems and the former ATK Thiokol’s Rocket Garden. There is a real transportation dichotomy in the Box Elder County desert west of Brigham City. The Transcontinental Railroad steam locomotives motored along at a top speed of 60 miles per hour, but most of the time they cruised at speeds closer to 30 miles per hour. Their big claim to fame was they could transport people across the country in less than a week. Northrop Grumman Innovation Systems (formerly ATK Thiokol) Rocket Garden has a space shuttle booster on display for the public to see. Just two miles past the turn-off of to the Golden Spike National Historic Park on Highway 83, is the Northrop Grumman Innovation Systems (formerly known as ATK Thiokol) Rocket Garden. The garden has displays of rockets and missiles built from the 1950’s to the 2000’s. One of the rockets is a shuttle booster that took the spaceship with its astronauts to a speed of 17,400 miles per hour. Visitors have a chance to see up close a Minuteman (a U.S. land-based intercontinental ballistic missile), a Maverick (air-to-ground missile designed to be launched from Black Hawk helicopters), an Atlas rocket motor and more. 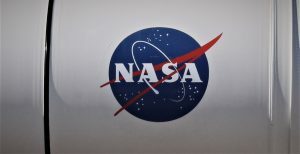 Kay Anderson, senior professional support staff at Northrop Grumman, said the outdoor museum was originally built in 1986. She said in 1995 the garden was expanded to the north to include the full area we see now. West of Brigham City, the Northrop Grumman Innovation Systems (formerly known as ATK Thiokol) Rocket Garden is an interesting display and not far from the Golden Spike National Park turn off. The graveled garden has a walkway with small signs that tell about each of the 39 pieces, which range from patriot missiles to booster engines to shuttle rocket boosters. Visiting the park is free to the public. To get to the Rocket Garden, take Exit 365 on Interstate 15 to Corinne and travel west about 34 miles. Pass the turnoff for the Golden Spike National Historic Site and go about another two miles.